Dyson V8 Absolute Cord-Free Vacuum is possibly the best cordless vacuum cleaner for carpets and hard floors. Whether is for dusty hard floors or fluffy carpets, Dyson V8 Absolute is a great Dyson vacuum cleaner to consider. If you’re looking to buy a cordless vacuum cleaner you should definitely think about Dyson vacuum cleaner. The pleased customers and great reviews speak for Dyson V8 and its quality. Are you looking to buy Dyson vacuum? Keep reading to learn why that’s a good idea. Dyson V8 Absolute is a great innovation in the family of Dyson vacuum cleaners. As we mentioned, Dyson V8 is a cordless vacuum cleaner that’s promising longer battery life. Of course, battery life is one of the most important things to consider when buying a vacuum cleaner. More precisely, you can get up to 40 minutes of suction with this Dyson vacuum cleaner. If you attach motorized floor tool you’ll get up to 25 minutes of battery life. Also, thanks to Direct Drive cleaner head that helps remove even more dirt, Dyson V8 has 150% more power suction. Dyson V8 will efficiently clean anything from dirt, hair, dust, etc. Another convenient feature is the HEPA filtration that captures allergens and expels clean air. Also, as many other Dyson cordless vacuums, Dyson V8 Absolute is easily converted to handheld vacuum. In addition, Dyson V8 Absolute is a lot quieter than many other vacuum cleaners today. In fact, some customers thought there was something wrong with their Dyson V8 because of how quiet it is. As we said, even when using Direct Drive cleaner or motorized tool, Dyson V8 won’t make much noise at all. Definitely, the most convenient thing about Dyson V8 is the fact that’s cordless. We can all agree that maneuvering an upright vacuum cleaner through your house is annoying if the cord keeps tangling and hassling. Therefore, getting a cordless vacuum cleaner is a better choice. Also, if you want to get close to your furniture and any small areas, Dyson V8 Absolute comes in with ease. Dyson V8 easily cleans hard floors thanks to its soft roller cleaner head. Cleaning carpets is a breeze as well, with Direct Drive cleaner head. In addition, Dyson V8 comes with Mini Motorized tool for stairs and furniture. We can all agree that’s very convenient to have such a multifunctional vacuum cleaner. There’ll be no more need for multiple devices. Finally, with Dyson V8 Absolute there’s no area that it can’t reach. HEPA filtration protects you from any allergens and dust, which makes vacuuming that much easier. Hygienic dirt ejector helps you empty the dust in a single action. Also, in case there’re some more difficult tasks, Dyson V8 offers 7 minutes of higher suction. Those 7 minutes of ‘max mode’ will allow you to clean any persistent dirt or hair that you thought impossible to clean. We weren’t kidding when we said this vacuum cleaner has everything you might need. Finally, Dyson V8 Absolute Cord-Free Vacuum is 50% quieter. Finally, there’s no more noise when vacuuming your carpets and hard floors. The good thing to do when trying to decide whether to make the purchase or not, is to read the Dyson V8 reviews. Reviews clearly show all the honest opinions of people who had their hands on the Dyson V8 Absolute. LIke with The Dyson V6 Absolute, you get all you need in one single vacuum cleaner. All the specifications of Dyson V8 Absolute Cord-Free Vacuum are what make it a great multi-purpose vacuum cleaner. Finally, with Dyson V8 Absolute there’s no need for multiple devices and vacuum cleaners when you can get it all in one. Look at this specifications table to see why there’re so many good reviews on Dyson V8 Absolute. Normally, warranty is always important when investing in house appliances. If you’re looking to buy Dyson vacuum, worry not, because Dyson V8 is covered with 2-year warranty. The warranty covers defects in workmanship and materials when used accordingly. Many reviews of this vacuum cleaner show how pleased are the customers with customer and warranty service. Of course, the warranty doesn’t cover any damage caused by misuse of the vacuum cleaner. We assure you that you won’t have any issues or trouble with your Dyson V8 if you use it accordingly. Dyson V8 Absolute works with HEPA filter and is certified as Asthma and Allergy friendly. Issues happen with any appliances, so Dyson V8 Absolute is no exception. Normally, just identify the problem first so you have no problem in fixing it. Any trouble you may have with Dyson V8 Absolute is easily fixable thanks to Dyson vacuum cleaner user manual. The user manual offers all the solutions. In case of damage that is more serious, you should report it to the service. If the Dyson V8 Absolute isn’t vacuuming properly check if you cleaned it well since the last time. Different things cause this. Also, intermittent power needs serious assistance. In this case, contacting the Dyson customer service is the best decision. Issue such as that can only be fixed by professionals at Dyson. Also, if you try to fix it by yourself you can make the issue even bigger. Another thing you may experience is the thermal cut out. Because Dyson V8 Absolute stops when it overheats, simply check the filter for any blockages. Please, note that it’s very important to know how to operate these things and always be safe. If by any chance, you’re not sure of how to fix the issue, feel free to contact Dyson to help you with your Dyson V8 Absolute. We’re sure you already want to replace your old vacuum with Dyson V8 Absolute Cord-Free Vacuum. This vacuum cleaner cleans all kids of dirt from all kinds of surfaces. That’s very convenient since you won’t have to buy more than one vacuum cleaner for your house and car. Its battery life, Direct Drive power suction and many other features will show you why Dyson V8 Absolute is a great solution. Also, think about the easy convert to handheld vacuum to easily clean your car and furniture. Dyson V8 Absolute is versatile and effective in any situation. Check out these car vacuum cleaners for more information. 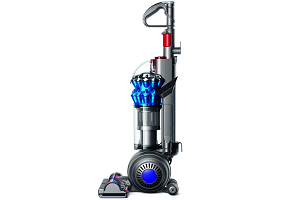 Do you own any Dyson V8 Absolute? Have you tried vacuuming with Direct Drive cleaner head and other attachments? What’s your previous experience with cordless vacuums? Please, feel free to comment down below. Stop buying bad products. Subscribe today! Join our weekly blog newsletter to get notified of the best products available for your home. We spend days researching so you don’t have to. We provides in-depth reviews of home products for shoppers who want the best possible option for them. Through extensive market research and hands-on testing, we provide you with everything you need to make an informed buying decision. For more information about what we do, take a look at a more detailed explanation. You can also check out how we make money without adding any bias to our reviews. Shark Versus Dyson: How Do The Giants Measure Up? © 2018 Clean Well Expert. All rights reserved. CleanWellExpert.com is a participant in the Amazon Services LLC Associates Program, an affiliate advertising program designed to provide a means for sites to earn advertising fees by advertising and linking to amazon.com. Please feel free to bookmark and share any articles you find useful on Facebook, Twitter, and Google+. Thank you.